Competition for promising investigational drugs remains fierce, with many assets snapped up before they have even started clinical trials. With the annual JP Morgan conference— typically an event where major deals are announced — now in progress, here we highlight some of the most valuable assets that are currently unpartnered, using data provided by EvaluatePharma. The assets are ordered according to their net present value (NPV) in Table 1, and the majority are at the phase 3 stage. 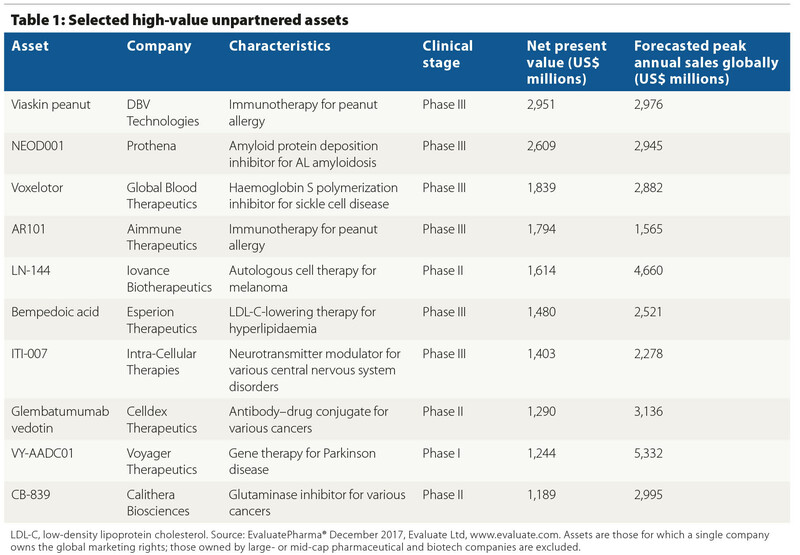 The asset with the highest NPV is DBV Technologies’ Viaskin Peanut, a pioneering immunotherapy for peanut allergy. In October, the company reported that top-line data from a phase 3 trial reported did not meet the primary endpoint, but development is continuing. Another of the high-value assets, Aimmune Therapeutics’ AR101, is also an immunotherapy for peanut allergy, which is estimated to affect several millions of people worldwide. Both products have received breakthrough designation from the FDA and could become the first therapeutics approved to help manage food allergies. All three of the assets at phase 2 are in the oncology area: LN-44, a cell therapy from Iovance Therapeutics; glembatumumab vedotin, an antibody–drug conjugate under development by Celldex Therapeutics (highlighted in our recent article) and CB-839 from Calithera Biosciences, part of an emerging pipeline of drugs targeting cancer cell metabolism. Finally, the only asset at the phase 1 stage is Voyagers Therapeutics’ VY-AADC01, a gene therapy for Parkinson disease. Following promising phase Ib trial results, a phase 2/3 program is anticipated to begin early in 2018.